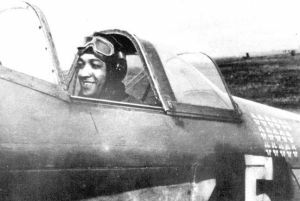 Roger Sauvage was one the few pilots of African descent to fly in both the French and Russian Air Forces in World War II. Sauvage was born in Paris on March 26, 1917, the son of a white Frenchwoman, Marie Sauvage, and a black soldier from Martinique. Sauvage’s father was killed during World War I, leaving him to be raised by his mother. Like many young Frenchmen of the day, Sauvage was fascinated by aviation and the heroic French fighter pilots of World War I. His ambition became to join the French air force, the Armée de l’Air. Sauvage studied mathematics and engineering and in 1935 was accepted for pilot training. By 1937 Sauvage was flying with the Groupe de Reconnaissance de Strassbourg. He soon tired of flying observation missions and requested a transfer to a fighter squadron. After retraining Sauvage joined a new fighter unit in 1939 and was assigned a Potez 631 twin-engine fighter. In May 1940, the Germans invaded France and routine patrols became desperate struggles for life and death. Although largely outclassed by the faster German planes, Sauvage’s unit acquitted itself well, downing 71 enemy planes. Sauvage recorded his first victory when he destroyed a German Heinkel bomber. In contradiction of all regulations, the exuberant pilot landed his plane near the crashed bomber and held the two surviving crew members prisoner until French soldiers arrived. Sauvage scored one more kill in France, but days later an armistice was signed. Like other French pilots who wanted to continue fighting the Germans, he fled to North Africa where he stayed until the formation of the Normandie Regiment, a unit of French flyers who would fight as part of the Soviet Air Force. Sauvage arrived at the Russian front at the beginning of 1944. Within six months after the French pilots arrived, three quarters were killed or wounded. Things improved, however, when the expatriates were given the new YAK-9 fighters and later the superb Yak-3. Sauvage’s group was always stationed close to the front lines, and they moved westward with the Russian advance. In early 1945, Sauvage participated in the destruction of a half dozen German aircraft. He ended the war credited with five individual victories and eleven shared with other pilots, making him a “triple ace.” At the end of the war the French pilots returned to France, arriving to a hero’s welcome at Le Bourget Airport north of Paris in June of 1945. Sauvage continued his career with the Armée de l’Air. In September 1945, he was promoted to Lieutenant, and in April 1950 he became Captain. Sauvage’s recounting of his experiences during the war became a popular book, Un Du Normandie-Niemen, published in 1950. In the mid-1950s he became involved in right-wing politics, aligning himself with Jean-Marie Le Pen. Sauvage remained in the Armée de l’Air until 1968 and was active in fighter pilot reunions. Roger Sauvage died in September 1977 in Nice at age 60. Thierry Bouclier, Les années Poujade: une histoire du poujadisme, 1953-1958 (Paris: Rémi Perrin, 2006); Gilles Bresson, Christian Lionet, “Le Pen”; Sauvage Roger - Normandie Niemen; http://www.cieldegloire.com/004_sauvage.php; “Les pilotes de chasse français 1939-1945,” http://aerostories.free.fr /pil_cha_fr/sauvage/; Biographie de R. Sauvage http://www.normandieniemen.com/rubriques/histoNN/bios/sauvage/sauvage.php. Thierry Bouclier, Les années Poujade: une histoire du poujadisme, 1953-1958 (Paris: Rémi Perrin, 2006); Gilles Bresson, Christian Lionet, “Le Pen”; Sauvage Roger – Normandie Niemen; http://www.cieldegloire.com/004_sauvage.php; “Les pilotes de chasse français 1939-1945,” http://aerostories.free.fr /pil_cha_fr/sauvage/; Biographie de R. Sauvage http://www.normandieniemen.com/rubriques/histoNN/bios/sauvage/sauvage.php.